Happy New Year! 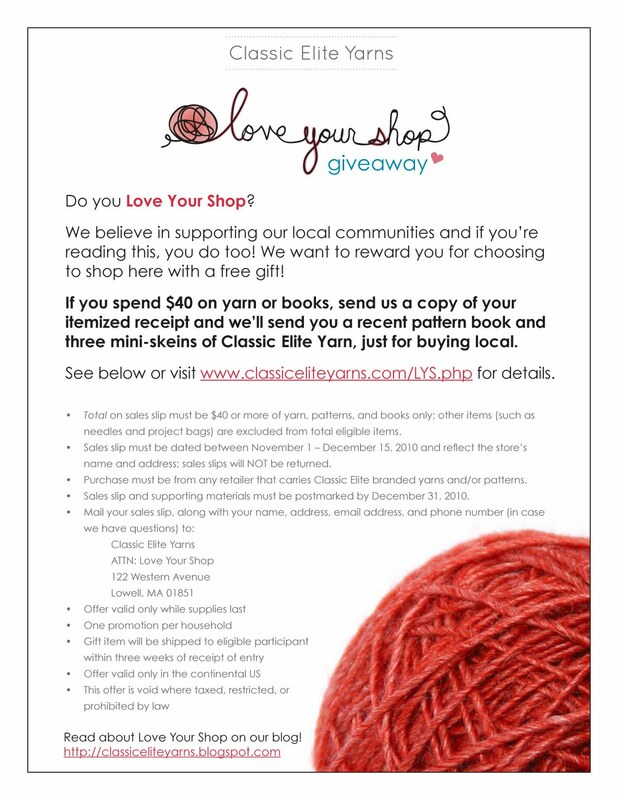 In 2010, I fulfilled a longtime dream by joining Classic Elite, and my greatest hope was to reach out and start a conversation with the fabulous knitters and crocheters who use our yarns. I wanted to hear what you had to say, and I wanted to share why I think our work is great. Today, our blog followers number in the hundreds, over 2200 of you are our "fans" on Facebook, and 1126 of you read our tweets. Thank you for listening, and helping me make my dream possible. This one is obvious, the "Magic Sweater". So many of you have commented on the Elizabeth cardigan designed by one of my favorite designers, Cecily Glowik Macdonald. It just looks great on everybody! Liberty Prints, our funky multicolored worsted weight wools, were huge in general in 2010. Everyone seemed to want some, and who can blame them? The color variations are beautiful, and the wool is springy, soft, and machine washable. The Molly scarf really shows off the colors. 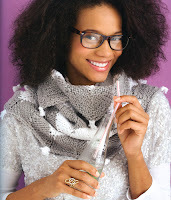 This Firefly scarf from Spring 2010 was also a standout--effortlessly chic and cool. It seems like this silhouette was everywhere this year, open-front sleeveless/short sleeved cardigans to slip over a long sleeve t-shirt, some were open, some suggested an i-cord tie. Haven in Wool Bam Boo is a beautiful cabled version. Woodland was a huge hit in 2010. A gorgeous yarn in our Verde collection made from wool and nettles, this unusual blend possesses a subtle luster and strong stitch definition, two qualities that really shine in Forest. 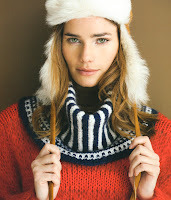 Mohair had its moment this Fall! Vogue Knitting even organized a whole contest around it. It seemed like it was everywhere, and La Gran has always been our Grande Dame. Boxcar is one of those cardigans that can take you right into Spring. This beret knit in Kumara is a great way to sample this luscious camel and wool blend. Fresco is perfect for colorwork! Clearly, you agree...I wonder how many people unwrapped these mittens this Christmas? Fingerless mitts were hugely popular-quick and useful knits that keep your hands warm while still allowing you to knit, or crochet, or text...all those activities made difficult by traditional gloves. These are knit in Wool Bam Boo. Crocheters got some great patterns this year too, this summery bag rolls up and fits perfectly in your handbag or glove compartment. Provence, our mercerized Egyptian cotton yarn, is the best choice for projects that require a strong and beautiful fiber. Magnolia was one of my personal favorites this year. I made some swatches for the blog. This cozy scarf can go from casual to fancy depending on which color you choose! 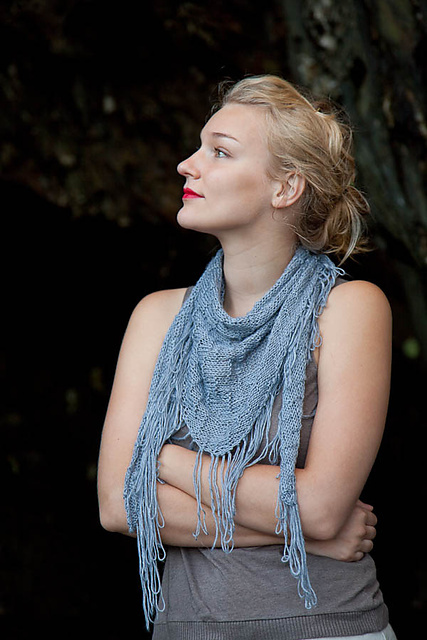 Véronik Avery's Lace Ribbon scarf knit in Alpaca Sox is the big winner, coming in at 5,314 projects on Ravelry! What was your favorite project this year? Its only a matter of time...I absolutely love this video, a sweater knit and crocheted in pieces to cover a Prius! Almost like a yarn-bombing, but without the element of surprise. Wouldn't it be fun to organize your own knit-out? Did you spot the chihuahua in the tiny sweater? So last time I mentioned swatching in the round for our Toasty Fingerless Mitts with the lovely and versatile Fresco. Gauge of items knit in the round differ from flat knitting because purl stitches and knit stitches are different sizes (this is also why stockinette will ALWAYS curl). Knit stitches are slightly wider than purl stitches, so when you knit stockinette in the round, eliminating the purl stitch entirely, you have a knitted garment in stockinette that is slightly wider than if it had included purl stitches. To knit a gauge swatch in the round, you must use a circular needle (or in a pinch, you can use a single DPN). Cast on your stitches. I'm going to cast on 30 stitches so I have a swatch large enough to measure. After you cast on, your ball end of the yarn is on the left side of your circular needle. Now, instead of turning your work and knitting back, you will slide the whole thing to the right, so the first stitch you cast on is at the tip of the right needle. Now, pulling the working yarn behind the work, knit from right to left as normal, leaving a large "loop" of yarn behind your knitting. Don't forget to leave plenty of slack on the working yarn to make it easier to measure your swatch when you're done. The completed swatch should look like normal stockinette on the right side (though your border stitches will be really saggy) and a series of strands across the back. Here is my completed swatch underneath my KnitChek. I got 13.5 stitches in two inches, so a gauge of 6.75 stitches per inch, slightly smaller than the recommended gauge. Think a difference of a quarter inch isn't a big deal? If you were knitting an adult sweater that is 34" around in the correct gauge (221 stitches around), that same stitch count would yield a sweater that is about an inch and a half smaller. It would also affect the total amount of yarn needed. So I said I wanted to match Lesley's measurement, right? 6.2 (inches) x 6.75 (stitches per inch)=41.85, rounded up to 42 stitches to cast on. Here I go with my mitts! Wow, do we have a ton of winners today! Thank you to everyone who entered, we love giving things away. Also, thank you to Soho Publishing, who made it possible for us to have 10 additional prizes to give away. It's so interesting to hear from the knitting community, sounds like many of you are already knitting up cowls this holiday season! Winners, please email me at chelsea at classiceliteyarns.com to tell us where to mail your prize. 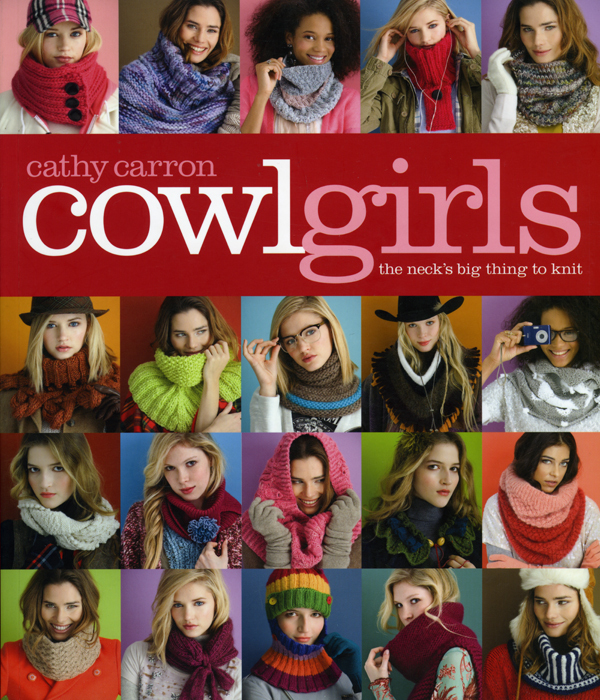 My wife and I are both into knitting cowls for men and women and this book would be a great addition to our library. The yarn would be nice too as we live a fair distance from a LYS. 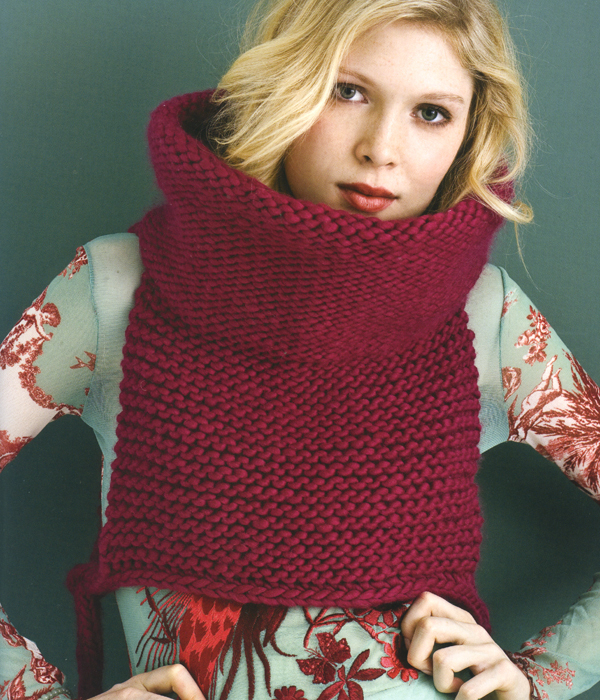 I have a cowl idea in my head I can't wait to translate into pattern and knitted format to share! This would make a nice Christmas present for me! Love Classic Elite Yarns! 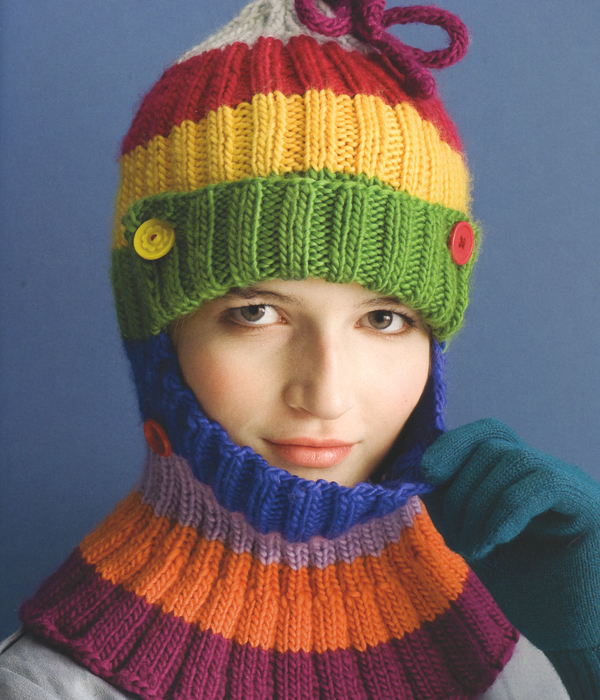 I've been struggling to knit hats and scarves. I am the only one without a hat or mittens this year! I'd love a cowl for myself and my daughter. Thanks! I love this book -- we carry it at the LYS where I work and it constantly sells out! I've been knitting cowls, a pair of socks, a beret, and hopefully a pair of mitts for holiday gifts. Great giveaway! I limit my holiday knitting so as not to drive myself off a cliff. But I'm working on a double-knit scarf for my husband, with a Jolly Roger motif to match a hat I made for him a couple years ago. He thinks I'm ignoring it, because he only sees me working on it every now and then. But I'm actually working on it about an hour every night while he's not home. :D Not sure if I'll actually finish it in time for Christmas, as I have knitting ADD and am also actively working on two other projects, but it'll be cold here till at least March and this isn't his main gift. Knitting shawlettes and clapotis for Christmas gifts. Since November I've been knitting small projects for my husband and me. Things like hats and fingerless mitts that keeps us warm and take no time to do. This book would be a perfect addition to my library! And now for our big winner! The one who takes home not only the book, but the yarn required to make one of four gorgeous Classic Elite cowls...Colleen! She said, "My mom, the knitter, would love a copy of this book. She is a knitter but not an internetter!" Guess what? She can have the book, and you can keep the yarn. Contact me to claim your prize! Thanks again for entering everyone. Be sure to subscribe by email or RSS feed to keep up with all our news. Some women came into my LYS the other day with a hat pattern for a discontinued yarn, and I, a good yarn store employee, suggested some substitutes. As soon as I mentioned "stitches per inch" and "measure your heads" and, (gasp!) "swatching", their eyes glazed over. I finished my explanation with some examples, and when I asked how they would ultimately figure out what yarn to use, they said, "Come see you!" Understanding the correlation between stitches and sizing and being able to analyze and use the information in a schematic is the key to unlocking some major knitting potential. I have some beautiful Fresco burning holes in my stash, and seriously long arms--fingerless mitts! I found these fingerless mitts, designed by our friend Leslie Friend at A Friend to Knit With, and they're perfect for bridging the gap between my cold hands and my perennially short coat cuffs (not to mention they keep my hands dexterous and warm enough to knit while waiting for the bus or the train). These gloves are designed in Portland Tweed, a lovely yarn indeed, but not the one sitting on my desk. The gauge is 5.5 stitches per inch, and Leslie asks that we cast on 34 stitches. Total stitches divided by stitches per inch=inches around of finished object. 6.2 inches is slightly smaller than the stated 7 inches around--I assume that this is giving the mitt some negative ease, which means you want the glove to be smaller than the measurement of your forearm (or else they won't stay up!) Ease is a conversation for another time. For now, let's just focus on matching the 6.2 inches. The recommended gauge of Fresco is 6.5 stitches per inch on a US 5 needle, the unknown in this case is the total number of stitches I will be casting on. Since we can only cast on in full numbers, we are going to theoretically cast on 40 stitches. This is only true if my knitting matches the recommended gauge. I know! You hate swatching. But it is a necessary step most of the time to achieve nicely fitted things. Since I will be knitting this in the round, I need to knit a swatch in the round. Stay tuned! UPDATE: Our friends at Soho Publishing caught wind of our giveaway and have offered 10 copies of Cowl Girls to give away! That means one First Prize winner will receive the book AND the yarn required to make one of four Classic Elite cowls; and 10 Second Prize winners will each receive a copy of Cowl Girls! Thank you Soho Publishing!! 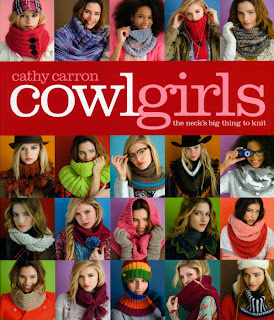 In our examination of all things giftable and fast, a review of the fabulous Cowl Girls by Cathy Carron seems appropriate (and aren't you lucky you can win a copy in the Winter 2010 issue of Knit Simple!). This is a must-have book for knitters who love portable, fast projects. This richly photographed book of cowls, gaiters, snoods, balaclavas and all things neck-hugging (don't worry, a glossary is included!) is a wealth of patterns in a variety of shapes, sizes, fibers and skill levels. And its chock-full of Classic Elite yarns! I think we have an abundance of rich, soft fibers that translate perfectly to sophisticated accessories, and clearly, Cathy Carron agrees. And now for the cherry on the sundae, we are holding a giveaway! One lucky commenter will receive the yarn required to make one of these cowls. Just let us know what you're crafting for the holidays by next Tuesday, December 14th, and you can choose between either of the Ariosa cowls, the adorable Sprout striped cowl, or the La Gran stackable cowl. Unfortunately, winners are limited to the United States and Canada. Comment here to win the yarn then head over to Knit Simple to enter to win the book! Don't forget to leave a Ravelry name or other identifier in your comment. This fun checkerboard print is for the colorwork lover. 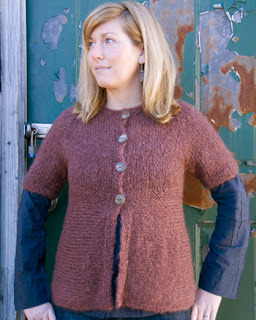 Knit in 8 different colors of Ariosa, I wonder if it would make a good stash-buster too? These stackable cowls take 4 hanks of La Gran and are knit in Trinity Stitch, a pattern you would be likely to see in an Aran sweater, translated into soft, lofty mohair. 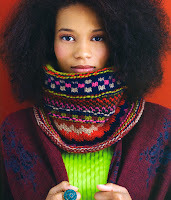 This striped cowl in Sprout adds tassels for fun, and is an easy beginning colorwork project! The color effect is achieved by knitting stripes in a pattern--the effect reminds me of Charlie Brown's sweater, zigzag stripes! Twinkle Soft Chunky is all over the place! Talk about fast, this could probably be knit in an evening, and the super soft roving-style yarn comes in a spectrum of colors from bright to sophisticated. I love how it tucks into your coat! 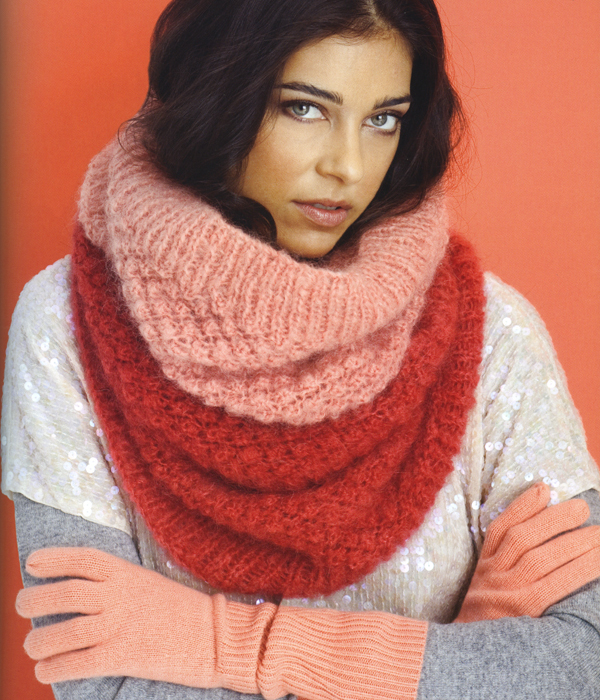 This sumptuous cowl is knit in Posh, our cashmere and wool blend, with an optional beaded embellishment. For your most disciminating (or sensitive-skinned) friend. This cowl in Inca Alpaca might take a bit longer to knit, but its worth it. These are three concentric rings cinched together with a ribbon for a flouncy, layered look. This striped number is a balaclava AND a gaiter in MinnowMerino! A balaclava is a tight hood to keep the cold out, and a gaiter is a snug neck covering designed for the same purpose. The i-cord at the top lets out to cinch it around your neck or pulls in to tighten the top of the hood. The weekend is upon us and Thanksgiving came and went...now the procrastinators (myself included) are thinking about holiday knitting. With just over three weeks, what's a girl to do? Consult our Web Letter archives for free patterns! By the way, if you don't receive our weekly emails, subscribe here for patterns and more! Perhaps my favorite gift idea, a chunky lace throw in Twinkle Soft Chunky for curling up with a cup of tea and watching the snow fall. One skein of Alpaca Sox completes a pair of cozy legwarmers. Perhaps a lacy cowl in Fresco? Whip up a pair of arm warmers with our merino and camel blend Kumara. 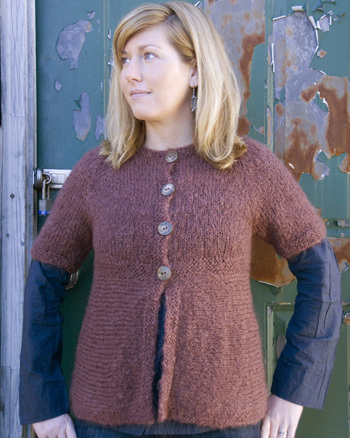 Or, for the truly ambitious, an Ariosa wrap cardigan.